I know most still have Christmas on the brain. But as usual, my mind has skipped ahead to the new year, and what I want to get accomplished in my apartment. First, I want to really make my space more streamlined and less cluttered everywhere. I am looking at every nook and cranny to see where I might better revise, create optimum storage space, and get things better organized. As I sit here in my chair with a pupster on either side of me keeping me warm in this rather frigid weather, I am gazing into my dining space and wondering how I might better utilize that space. Somehow there is just too much for my eyes to land on. It is too busy and frenetic in there. My beloved outdoor space is highlighted by the patio doors, and I must keep that area clear so I can gaze outdoors during the winter months while I can’t get out and garden. So, less furniture? A different set-up altogether? Moving things around? Wall shelves? As it is, I think I’ve just about squeezed all the space for storage I can in the kitchen. At least until I stumble across a better idea. The living room is fairly stuck on how I can arrange furniture due to the way the space is laid out. I am reconsidering the gallery wall around my TV, however. Somehow it is beginning to be “too busy” for these eyes of mine. I’m thinking of a more calming look. So, how can I create a better layout for that dining space I stare at from this chair as I work on my laptop every day? Well, that’s what I’ll be rethinking for the new year. Do you have a space you’d like to recreate or better utilize for your needs? If so, maybe we can work on this task together. As time goes on, needs change of course, and we must change our surroundings with them. 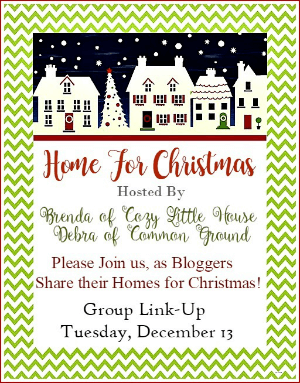 Remember the Home For Christmas link-up will go up at 9 a.m. tomorrow morning on both mine and Debra’s blogs. I need better storage for my linens…that's a big one for me. 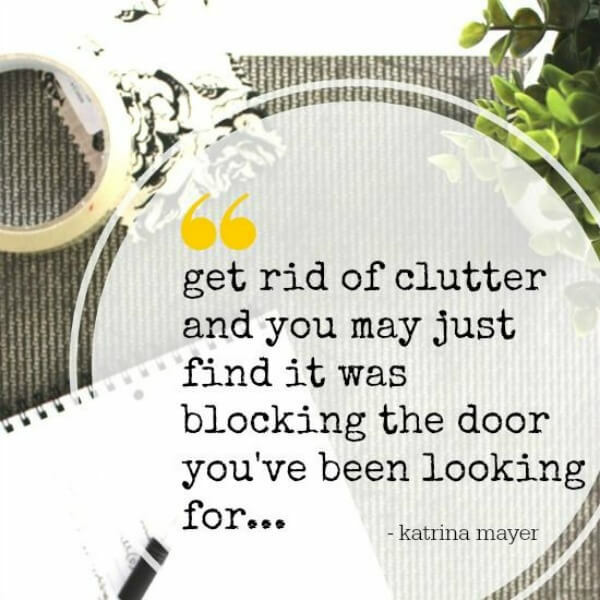 And I need to start purging….I have a closet downstairs that is full of boxes and it needs to be sorted. Also, I need to get on top of my filing – I hate it, so I avoid it….but then the pile grows, and the task becomes much harder. Uggghhh! Table in middle of room freeing up wall space to move a cabinet? Great minds think alike 🙂 I tossed a bunch of stuff while I was decorating for Christmas. Then I did a serious purge on what was stored in the guest room. Tomorrow I'll purge my closet and then be able to say the only things here are what I use or want to look at, which isn't gonna be much. 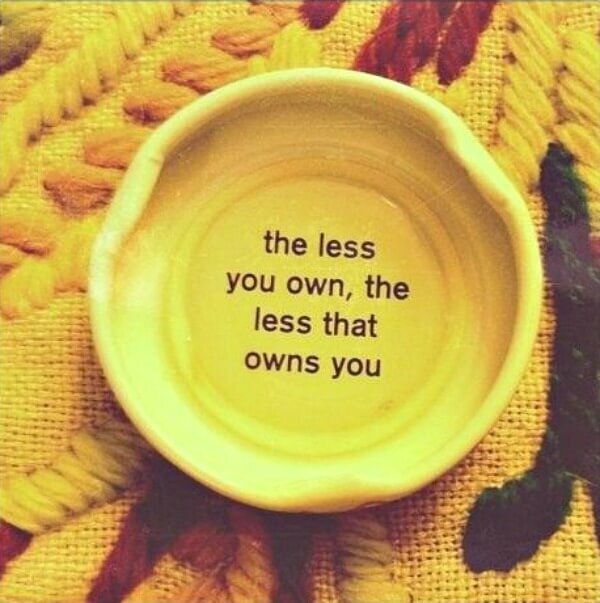 That quote about the less you own, the less that owns you is so true. We have slowly been tackling different rooms in the house and doing a lot of purging. It feels so freeing not to have to think about so much stuff now… just enjoying the uncluttered space. I have two garages and a shed. My car goes in one garage, yard tools and summer outdoor furniture. My second garage is my work shop and junk storage. I have furniture in there that I have restored and plan to restore in the future. This spring I am cleaning it all out. I will have a yard sale and even if I do not get the prices that I originally hoped to get, its gone. I am so tired of moving things around to get what I need. I have put items in there that were in my house and no longer use. Its full of unnecessary junk and its time for it to GO. We purged so much when we downsized to this little house for retirement. And now living in such a smaller home I like things stored away and a clean minimal look. Just a few special things out and I rotate things with the seasons. I don't shop for new things either. I use what I already have. And I don't have a lot on the walls now either. I just don't care for a busy look anymore. But I keep things cozy with pillows and afghans on the sofa and chairs. We're really enjoying living in this smaller place with so much less stuff! I will say though the process of getting here was difficult, but I don't miss what I gave up at all. I love texture. like all your beautiful quilts. and the colors you use. that to me is what's so beautiful in your cottage apt. those are the real ways I think of as making a home cozy. just a few beautiful things that make big statements. the eye can rest. and the empty spaces make those that do have small vignettes just sing. it's all the 'little things sitting everywhere' in a home that usually drives me crazy. but then i'm claustrophobic. and not everybody is. i realize that most people love all the small items. but I love your furniture. I wouldn't get rid of any of it! well… except the coffee table that's now in consignment of course! LOLOL! don't you just love a new year and fresh beginnings! 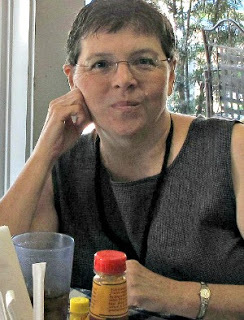 Oh Brenda! I swear we are twin sisters in spirit! I have spent the past couple of weeks purging more stuff, three big boxes full. I also sold my huge cream colored country french armoire and purchased a TV stand with the proceeds. I sold my dining room set and my living room chair and bought replacements. I am getting away from so many dishes and accessories, and am working toward a more simple look. Less is more! My new look is what I call a "modern rustic" look, all done in beige, brown and greens, and cleaner lines in the furniture pieces, with some rustic touches in baskets, etc. I got rid of my china hutch top and the extra china and glassware, and I am using the bottom piece as a buffet for additional storage, as like you, I live in a small one bedroom apartment. 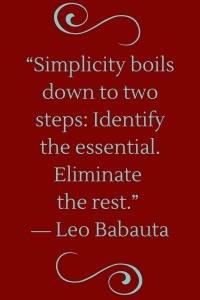 The more I purge and simplify, the more peaceful and relaxed I am feeling. No longer will I have a "summer look" and a "winter look". the most change I want is to maybe change out throw pillow covers and placemats on the the dining table. I have discovered that although I love looking at bohemian rooms, and lots of color, it makes me feel restless and a bit agitated to live with it every day. Its very important for me to have a calm space where I can be quiet after a long day of work. I have found that one can either have things on the walls, or things on table tops, but not both if you want the space to be home. I have very little on my walls. I always get compliments on hell soothing and comfortable my space is. 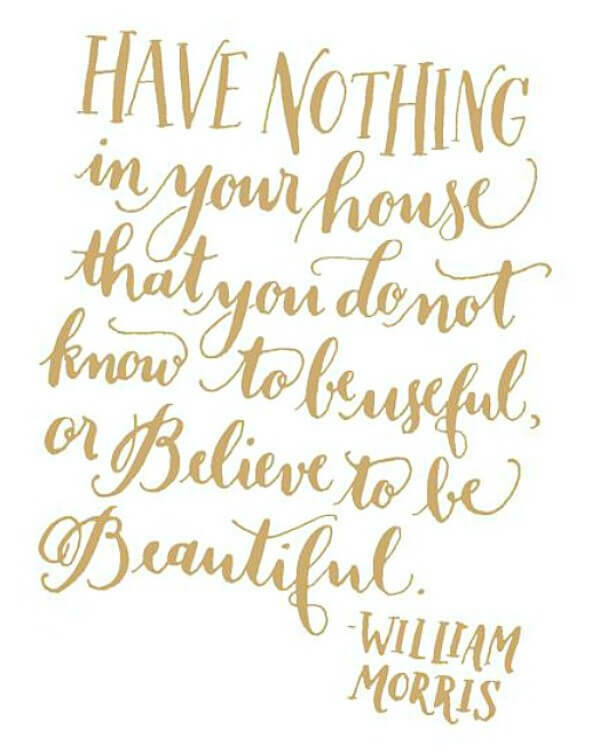 Oh that quote from William Morris. He sounds like a fussy home economics teacher. The way it starts with the negative command, "Have nothing…" — I just have to defy it by having a bit of ugly, useless stuff around the house.